Three different Volpi artisan cured salamis, a Chianti, Pinot Grigio and Sparkling Wine salame are included guaranteed to please all the meat lovers. We made sure to remember cheese lovers as well with a selection of wine infused cheeses. Yancy's Champagne Cheddar, Snowdonia's Ruby Mist Port and Brandy cheddar and Sartori's Bellavitano Merlot Cheese will put a smile on anyone's face. A jar of Onion Cabernet Condiment and Cherry Shiraz Preserves uniquely, fragrant and delicious, these Tishbi Preserves are perfect for spreading on the American vintage Wine Biscuits. Don't worry, we have thought of everything and included a cheese spreader as well. Rounding up this gift is a bag of amazing Torres Sparkling Wine Potato Chips - potato chips with fruity notes and lightly popping. 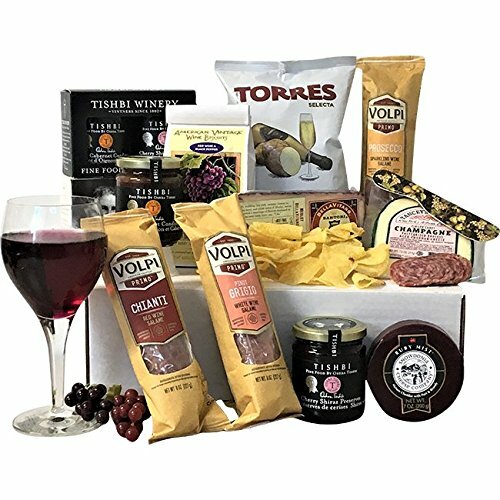 Gourmet, Charcuterie, Cheese, Wine Themed, Artisan Cured Meats Gifts. Makes a great wedding gift for the new couple. Great Birthday Gift for Wine and Cheese Lovers. Perfect Corporate Gift for Business Associates and Clients.